This finely crafted sling is built from the best American premium grade cowhide available. 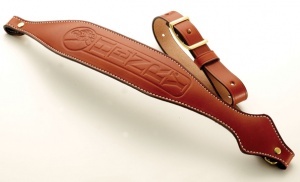 Finished in a saddle tan, it is stitched with heavy nylon cord, padded with thick open cell urethane foam, lined with suede for stability and comfort and features a deeply embossed Henry logo. The extra wide sling features the exclusive Carry Grip and tapers to 1 to accommodate most popular swivels. The Henry sling is 100% American made by DeSantis Gunhide exclusively for Henry Repeating Arms. Mounting of the Henry sling requires installation of swivel stud kit.